One of the newest and most controversial approaches to financial pricing. In Physics of Finance the author applies the methods of theoretical physics to financial economics to develop an altogether original method for pricing financial assets that steps outside the equilibrium paradigm in finance. 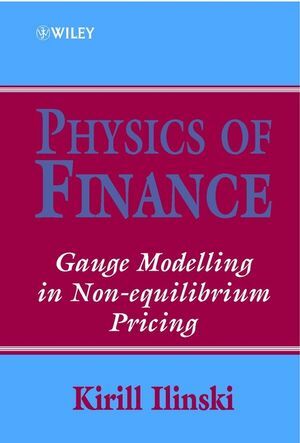 In Physics of Finance, basic assumptions underlying equilibrium pricing are re-examined, the risk factors hidden in the implications of equilibrium theory and the potential profit in unstable markets are discussed and gauge modelling is introduced. Kirill Ilinski graduated from the Physics Department of Leningrad State University. He received his PhD in mathematical physics from the Leningrad Branch of the Steklov Mathematical Institute of the Russian Academy of Sciences. He spent five years as a Research Fellow in the School of Physics at the University of Birmingham, where he became interested in applications of methods of theoretical physics to financial economics, and attracted the attention of both financial researchers and practitioners by introducing gauge modelling of asset prices out of equilibrium. He has written over 50 articles on financial mathematics, mathematical physics, mathematical methods in statistical physics and the theory of correlated systems. Dr Ilinski has joined the Equity Derivatives Desk at Chase Manhattan in London. Fibre Bundles in Finance: First Contact. Fibre Bundles in Finance: Gauge Field Dynamics. Dynamics of Fast Money Flows: I.
Dynamics of Fast Money Flows: II.